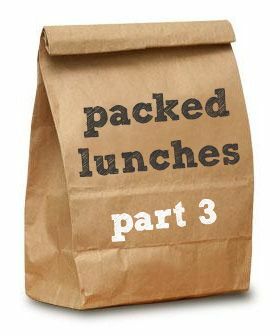 I wanted to share some general packed-lunch tips today - I hope you'll find them useful. I use an insulated lunch bag for Grant's lunch and he does have access to a fridge at work. If you need extra help keeping your lunches cool then check out the products made especially for lunch bags, like this flexible ice pack or this 4-pack of mini ice packs. On Pinterest I also saw the idea of freezing a wet sponge in a small ziplock bag to use as an ice pack. There are also fantastic thermos products to keep food warm, like this 10 ounce stainless steel one, or this purple Funtainer. If you are using airtight containers your food should stay pretty fresh, even if you make things in advance. To keep bread from going soggy it's important not to skip buttering - the butter creates a seal over the bread surface so that sauces or juices from the food placed in the sandwich won't soak in and make it soggy. At the very least, be careful with how you layer your sandwich fillings - lettuce or cheese will also help prevent the bread from getting soggy so try to layer those on first / last and keep juicier fillings in the middle. Use your freezer by splitting and freezing packs of wraps, rolls or pita pockets. For example, let's say you open a 6-pack of pita pockets. Instead of every lunch for the next 6 days containing a pita sandwich, use one and freeze the rest for future use so you can switch things up without them going stale. It's also a great idea to make up batches of soup or casseroles and freeze them in portions for those busy days when you don't want to spend a lot of time creating lunches. It's easy to just grab a meal out of the freezer to add to your lunch bag. It helps to have plenty of containers so that you never run out, even when half of them are in the dishwasher. Don't forget to prep ahead - portion out nuts, chips, crackers, etc into sealed containers and stack them in your pantry or cupboard, ready to grab. If you are baking treats for lunches (like I do for my boys) then it helps to bake, cool the item, portion them, wrap them in foil, and freeze them. They can grab a snack straight out of the freezer in the morning or the night before and it will have defrosted by the time they eat it. I highly recommend making lunches the day or the night before to save on the morning rush. In fact, depending on what you are making you could make an entire week's worth of lunches and leave them in the fridge. For instance, my Noah currently only wants a peanut butter sandwich and something for morning snack so I have made his sandwiches for the rest of the week, wrapped them in plastic and put them in the fridge for him to grab each morning. (I was feeling generous - he usually makes his own lunches!) All he has to do is add a treat from the freezer and he's good to go, streamlining the morning scramble. Daniel is having hot dogs this week (he eats them cold) and they're sauced, sausaged, wrapped and ready. Snap a quick photo or just keep notes on the lunches you've made. If you're ever stuck for ideas you can flip through your record and copy one you've made before. And that's it for packed lunch tips! I hope some of this has been helpful or inspiring. Let me know what your favourite packed lunch tip is in the comments down below - I'd love to hear from you!